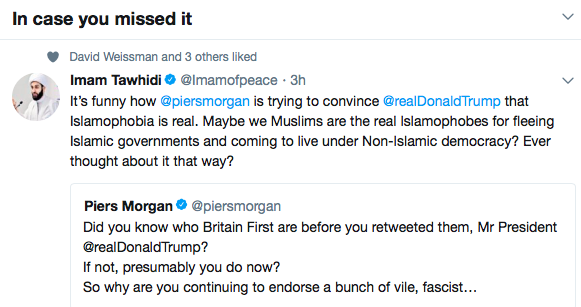 Who’s paying Piers Morgan to be a Mohammedan agitprop? We know who Britain First is: they are patriots. 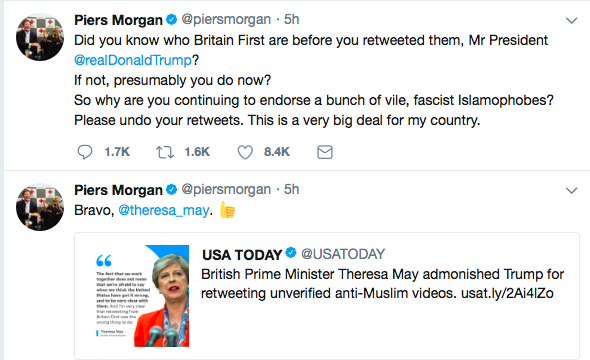 But do you know who Piers Morgan is? Piers Morgan was sacked as the editor of the Daily Mirror as the newspaper’s board made an unreserved apology for publishing fake pictures of British troops torturing Iraqi prisoners. Jayda Fransen, of south-east London, was the little-known deputy leader of Britain First until inflammatory messages she posted online were picked up by the US President. White, British teen planned terror attack on Justin Bieber concert for “Allah”. Tell me again about how Islam is a race, idiots. Holla! Its Daisy… again! The tilt of Abdul Rauf, the healer, the slick imam who wanted to build the Ground Zero mosque. Just goes to show that these creatures are deeply embedded in the system, ready to strike whenever there is resistance to the Islamic expansion program. • TRAITOR islamophile cultural marxist PC’d mind controlled dolts … all in one easily transportable package ! • aiding and abeting islam !!! • aiding and abetting criminal African Tribals !!! (even if it is) Faked – Truth is STILL Truth !! !